ViewSonic has recently released one of their monitors from the professional series, the ViewSonic VP2768. The monitor is a real delight for professional designers of all sorts ranging from photographers and graphic designers to video editors. In addition, it offers an ultra-thin bezel for a seamless multi-display viewing experience as well as extensive connectivity and ergonomic options. The monitor features the SuperClear IPS panel with 8-bit color depth and factory calibration to Delta E < 2, among other things. On a related note, we’re still waiting for the release of other ViewSonic professional line monitors which were introduced at CES in January. 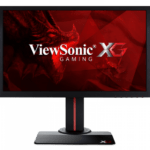 One of the most anticipated monitors from the series is the ViewSonic VP3881 PC monitor which will boast a 37.5-inch curved screen with 3840×1600 resolution at 24:10 aspect ratio while the ViewSonic VP3268-4K involves a 31.5-inch screen with a 4K UHD resolution. Both of these monitors will feature the SuperClear IPS panel and factory calibration to Delta E <2 in order to suit a vast range of designers’ demands. They will be available sometime in Q3 and in June 2017 for $2,000 and $1,360 respectively. In other news, ViewSonic will also release the ViewSonic VX2781-UC display which is designed for multimedia/entertainment purposes rather than professional designing. It will feature 1440p, ultra-thin bezel and fully ergonomic design, the SuperClear IPS panel, and the USB 3.1 Type C for simultaneous video/audio content streaming, data transfer, and charging possibilities. It will also be available in June, for $750. ViewSonic’s SuperClear panel includes an AH-IPS panel which ensures the ultra-wide viewing angles of 178 degrees both horizontally and vertically. Moreover, it allows for the state-of-the-art color accuracy and consistency adequate for the high-end professional color-critical work. In order to provide all designers with the suitable conditions, the monitor is factory calibrated to Delta-E < 2 and comes with color gamut reports for the sRGB, EBU, SMPTE-C, Rec709, and DICOM-SIM color spaces. The ViewSonic VP2768 offers 14-bit 3D LUT which generates a palette of 4.39 trillion colors for color processing. The monitor also has a 6-axis color adjustment feature for the complete color processing customization. In addition to the color calibration features, you can also separately purchase the ViewSonic Colorbration Kit for easy and effortless hardware calibration for photography, graphic design, and other content creation. The screen uniformity is ensured by an integrated feature which ensures color uniformity across the entire screen with consistent color and brightness at all times. The 1440p resolution on a 27-inch screen provides a perfect screen space/detail relation due to the high pixel density of 109 pixels per inch which in turn ensures both spacious workspace and abundance of details. Naturally, the ViewSonic VP2768 1440p display shouldn’t even be considered as a gaming monitor due to the slow response time speed which would result in ghosting and trailing of the fast moving objects in video games. In the fast-paced games such as the competitive FPS, the motion blur of 14ms response time speed is too severe for a smooth gameplay. Additionally, for the same price, you can get a gaming monitor with high 144Hz refresh rate and the adaptive-sync technology. The slow-paced and turn-based video games run just fine on this monitor and in fact, look pretty awesome due to the exceptional color reproduction. 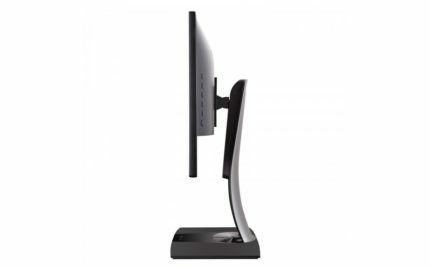 The design of the ViewSonic VP2768 consists of a fully adjustable stand with 130mm height adjustment, 120 degrees of swivel to the left and right, a 90-degree pivot function, and -5, 21 tilting ability in addition to the 100 x 100mm VESA mount compatibility. The screen of the monitor is covered with an anti-glare 3H hard coating which entirely eliminates the sunlight reflection. The ultra-thin bezel makes it ideal for a seamless multi-display viewing experience. In addition to the narrow bezel design which is ideal for multi-monitor setups, the DisplayPort and miniDisplayPort make for an effortless daisy-chaining connecting of multiple monitors. Apart from the DisplayPort connectors, there are two HDMI 1.4, an audio line-out, four USB 3.0 ports, and one USB-B which needs to be connected to the PC in order for the other four USB ports to work. 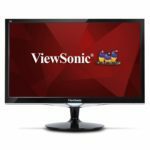 At the moment (May 2017), the ViewSonic VP2768 IPS display is available for $490. Considering its impeccable color accuracy and consistency which meets the demands of many diverse professional designers, it’s an appealing price, to say the least. Add to that the flawless design and extensive ergonomic and connectivity options, there’s nothing an aspiring or the high-end professional will lack. 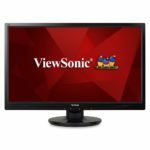 The ViewSonic VP2768 is also available as 4K resolution monitor, the ViewSonic VP2780-4K monitor for an additional $115. The other two monitors are significantly more expensive. 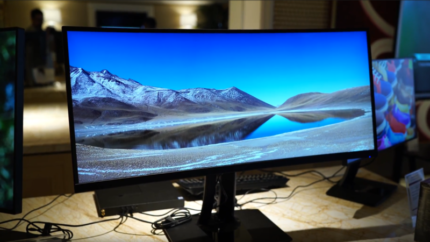 The ViewSonic VP3881 will be available in early Q3 for $2,000 which is understandable due to its cutting-edge 3840×1600 resolution, 24:10 ultra-wide aspect ratio, and 1900R curved IPS display. The ViewSonic VP3268-4K PC display will cost $1,360 which is pretty much as expected from a high-end professional 4K UHD monitor. Overall, the ViewSonic VP2768 is a compact professional monitor that satisfies the needs of photographers, graphic designers, and video editors thanks to the precise factory calibration and many exclusive features for color processing. The sRGB color gamut makes it ideal for photographers while video editors can rely on Rec709, SMPT-C, and EBU color spaces; All of which have a flawless color uniformity. In addition to the beautiful thin-bezel design and the plethora of connectivity and ergonomic functionalities, the monitor ticks all the boxes. All of that under $500 makes the monitor a pretty sweet deal for the professional designers of all kind. Going back to the mentioned VP3881 and VP3268-4K models, we can expect the same impeccable image quality due to the factory calibration to Delta E < 2 and the exclusive color processing features. Apart from their resolution, screen size, and panel type, there is no more information available at the moment, so we will get back to you as soon as something comes up. The ViewSonic VP2768 offers a crisp resolution and the impeccable color accuracy and consistency for numerous color spaces factory calibrated to Delta < 2. Additionally, it features a thin-bezel design and plenty of connectivity options for an all-around perfect professional monitor. 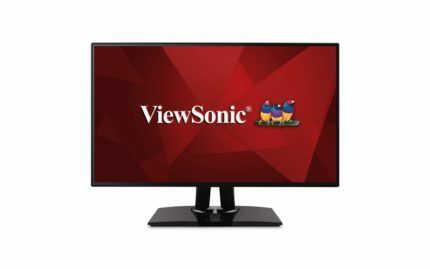 I wonder why Viewsonic released this model? It is exactly the same as the VP2771 but the VP2771 was 5ms GTG. getting worse on left side of this monitor.